The polecat used to be called a 'foul mart' because of its strong smell. 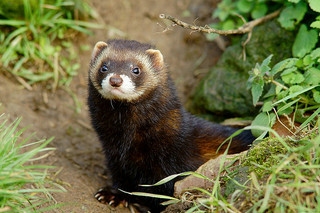 The name polecat is said to be from the French poule chat,'the chicken cat' and it will kill chickens given the chance! Distribution: mainly in Wales but spreading. Widespread throughout the rest of Europe, as far north as southern Sweden & southern Finland. Habitat: variety of habitats but most often found in woodlands & hedgerows. Size: male:- head & body 38cm; tail 14cm. Female is smaller. Description: long, almost cylindrical body with short legs & tail. Dark brown fur with yellowish under-fur showing through; black underparts, legs & tail; white patches on face giving a distinct dark, mask-like pattern. Weight: male up to 1.5kg. Female a little over half this. Life-span: up to five years or more. Food: mainly rodents, also rabbits, frogs, fish, worms and birds. The polecat used to be called a 'foul mart' because of its strong smell. The name polecat is said to be from the French poule chat,'the chicken cat' and it will kill chickens given the chance! Ferrets are creamy-white, domesticated polecats used to catch rabbits, and some escape or are lost. Many of these ferrets have reverted to polecat colouring over the generations and are known as polecat-ferrets, though they usually have a paler forehead and no mask. They also interbreed with true polecats so polecats vary in colour depending on how much ferret and how much true polecat is in their ancestry. Polecat-ferrets are found throughout Britain.